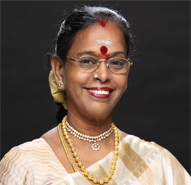 Krishnakumari Narendran who has over twenty five years of experience in the field of dance, is the founder -director of Abinaya Natyalaya and has been the vital force behind this institution for over two decades. She has trained and given to the world of Bharathanatyam many talented artistes. She is a veteran Guru, well known for her imaginative choreography and scintillating nattuvangam. She is well known for her group productions, and Abinaya Natyalaya has a cultural repertoire of over fifty thematic solo and group productions. These productions have won great appreciation from audiences both in India and abroad, as well as from the press. 'Navagraha Ula ', based on the nine planets which incorporated, for the first time in bharathanatyam, computerised animation and special effects was a great success. This is a mega production in which 60 dancers participate. This ballet incorporates, for the first time in dance, digital animation and visual special effects. The mythological and factual details about each planet are depicted. Navagraha Ula was a major success in Chennai and has now also been released as a video. The press has been unanimous in giving Navagraha Ula excellent reviews. Navagraha Ula has been released as a full length video tape. Sri Venkatadri Vaibhavam, is Abinaya Natyalaya's latest production. This production incorporates a unique blend of religion,music, dance and visuals to chronicle the greatness of Tirumala-Tirupathi. ‘Sri Venkatadri Vaibhavam’, which is choreographed entirely by Krishnakumari Narendran, has been set to music by violin maestro Kunnakudi Vaidyanathan. The Tamil lyrics have been penned by Sreekavee. This unique multimedia production enjoyed a very successful performance tour of the United States of America between June and August 2001. Krishnakumari Narendran is a recipient of the prestigious Kalaimamani Award which is sponsored by the Government of Tamil Nadu. With her versatility and distinctive style of choreography, Kalaimamani Smt. Krishnakumari Narendran has carved a distinct niche for herself in the world of Bharathanatyam .She has been bestowed with many titles, Natya Natak Priya, Natya Rathna, Nrithyarathna and the prestigious Kalaimamani are to name a few.